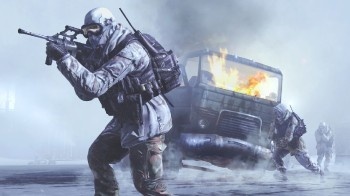 Customers at the Best Buy in Scranton, PA, will have a chance to throw down with real soldiers from the Pennsylvania National Guard when they swing by to pick up their copies of Modern Warfare 2. The idea of warming up for digital soldiers by tangling with a bunch of real ones doesn't strike me as a particularly wise idea but then I've always felt that one of the great things about videogames is that I can shoot as many people as I want and nobody ever actually shoots back. The same is true for this Best Buy premiere, of course; they're not going to hand out M16s to gamers or set up hand-to-hand exhibitions in the home theater section. Instead, you'll have a chance to take on members of the Pennsylvania National Guard in the time-honored martial art of Laser Tag. The Scranton Warfare Premiere will take place outside the store, said David Partenio of Best Buy, while a Modern Warfare 2 LAN party will rage on inside. The store will also be offering a "pre-order price match" program, in which anyone who brings in a receipt showing a $5 pre-order placed at GameStop, Walmart or Toys R Us will be given $5 off the price of the game at Best Buy. Kotaku said Best Buy was "testing" the program, indicating that we might see more of this sort of thing in the future. This won't be the first time Best Buy has gone all-out for a videogame launch: In March the store in Stroudsburg, PA, held a "Blood Red Carpet Event" for Resident Evil 5, featuring a haunted house, contests, a horde of zombies and another appearance by the National Guard, this time struggling to stem the tide of the undead. The presence of the Army at a videogame-themed event certainly won't go over well with everyone but it sounds like fun to me. More information about Best Buy's Modern Warfare 2 premiere in Scranton will be revealed soon; in the meantime, if you're going to be in the neighborhood on November 10 anyway, why not swing by and check it out?